I purchased this beaut in January right after Christmas, on sale!! *Insert Happy Dance Here* I will have to do some sleuthing to find pics of the old couch for comparisons sake. Let’s just say the old couch was holey and I don’t mean Holy in the God sense, but holey. The previous owners had dogs that enjoyed chewing on furniture. But at the time it was a great deal for a poor college kid, and they delivered!! The new couch is leather with red undertones. I used to hate leather couches, until I got my Annie dog, then I realized why people buy leather couches. Muddy paw prints are so much easier to get off of a leather couch than say a twill one. I love it! 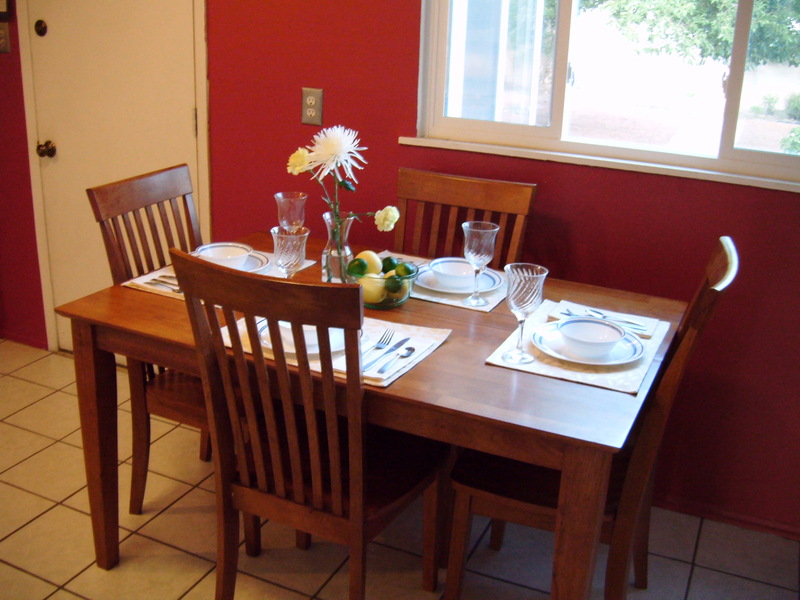 In fact, the day after it’s arrival I invited my mom over to Chez April, so that we could use more than two chairs! That was very exciting, I even took pictures of everyone eating. I won’t share those, I think I’d be in trouble with both the momma and the sweetie then! Yes, I have a red accent wall. Some would say they are cliche, and expected, but I love it. Especially since I see that wall when I am sitting on my sweet new couch. It’s another element in my casa that makes me happy so it’s staying, trends or not. Or until I get the painting bug again. But the point of this post was to talk about living room chairs. The chair we have in our living room now, was generously given to us by a friend of a friend, whose grandma passed away. Very sad, but I was happy to help them out by taking some of the furniture they didn’t know what to do with. 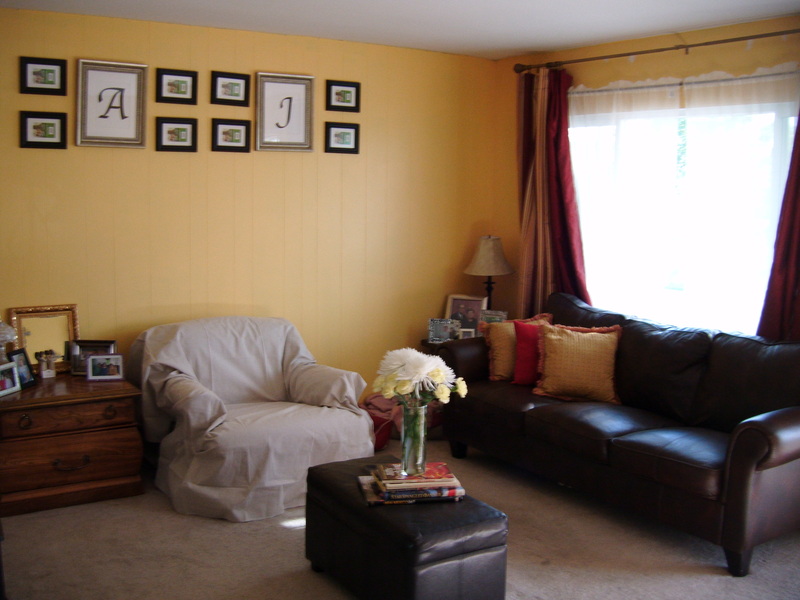 In the picture at the beginning of this post, I have it covered up with a drop cloth, because the upholstery is less than modern. But the chair itself is so snuggle worthy. Between myself, the sweetie and Annie dog, there is a constant battle over who gets to sit in it. This has me a little undecided if I should buy a completely new chair, or have this one re-upholstered. 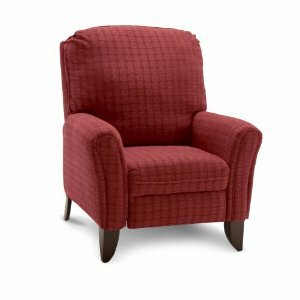 The above chair is a recliner, but doesn’t look like those giant “man” recliners one would think of when recliner comes to mind. I love that there are 20 different colors you can order it in. Choices so many choices!!! This chair I have been looking at for a long time. But I’m not sure how it would look in a yellow living room. I kind of wanted to go a little lighter in color with the chair, since the couch and curtains are so dark. 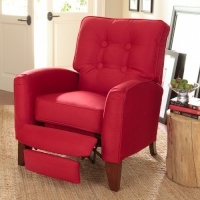 This chair is also a recliner, I love chairs with pleasant surprises like that! 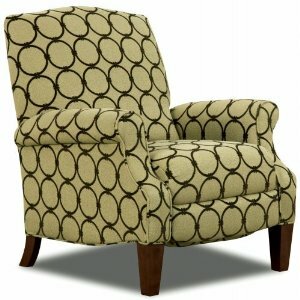 It’s hard to think about purchasing a chair that costs as much if not more than my couch. So, for now I will be on the hunt until some unsuspecting bargain catches my eye.